The Nashville area is a great place to live and work. The area has many strengths in all facets of community life and well-being. The average yearly temperature for Nashville is 59.0 F with an average maximum temperature of 69.8 F and an average minimum temperature of 48.6 F. The average rainfall for the area is 47.3 inches and the average snowfall for the area is 11.1 inches. Please click on this link to find valuable information about Nashville Public Schools. This area provides individual profiles on all public, special needs, and magnet schools in the Metro Public Schools System. The Nashville area is the 35th largest urban district in the U.S. with 160,000 students in grades K-12 within 9 public school systems. There are numerous magnet schools with special programs for gifted and talented students and a Montessori school in the system. The area boasts more than 70 private and parochial schools. More than 60% of students pursue higher education. Currently all schools are using industrial technology to create 21st Century Classrooms which provide extensive prep-tech programs and the ACT Work Keys system for better prepared students. The Tennessee Department of Education can provide additional information at (615) 532-4709. The first settlers in what is now known as Nashville were Indians of the Mississippian culture, who lived in the area about 1000 to 1400 A.D. They raised corn, made great earthen mounds, painted beautiful pottery -- and then mysteriously disappeared. Other Indians, the Cherokee, Chicksaw and Shawnee, followed and used the area as a hunting ground. French fur traders, who established a trading post, came to the area around 1717. The first settlement, however, was not established until 1779. It was then, on the banks of the Cumberland near the center of present downtown Nashville, that a band of pioneers led by Englishman James Robertson cleared the land and built a log stockade. This was Fort Nashborough, named in honor of General Francis Nash who won acclaim in the Revolutionary War. John Donelson and some 60 families followed in April, 1780, to settle the new community that was then a part of North Carolina. In 1784 the community's name was changed from Nashborough to Nashville. 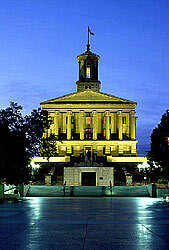 Tennessee became the sixteenth state in 1796 and Nashville was made its permanent capital in 1843. By 1860 Nashville was a prosperous city, soon to be devastated by the Civil War. Because of its strategic location on the river and the railroad, the city was occupied by Federal troops for three years. The Battle of Nashville, fought in 1864, was the last aggressive action of the Confederate Army. In the decades following the war, Nashville once again experienced a growth in population, business and industry and education. Another area of growth was in country music, which has grown to the point that Nashville today is known as Music City, USA.